The sensational Reveal Marquis seems to hold you in its gaze as the diamond centre appears, emerging from its precious metal setting above a fine stream of diamond pavé flowing within the white gold band below. A genuinely captivating piece, with a distinctive marquis shape that marries enduring classic appeal, sleek, exceptionally technical detailing and wonderfully clever design. A stunning 0.50ct diamond centre G VS2 set in flawless precious 18ct white gold. Available in a host of gemstones including diamond, coloured diamond, sapphire and ruby, and in platinum or 18ct white, rose or yellow gold settings. 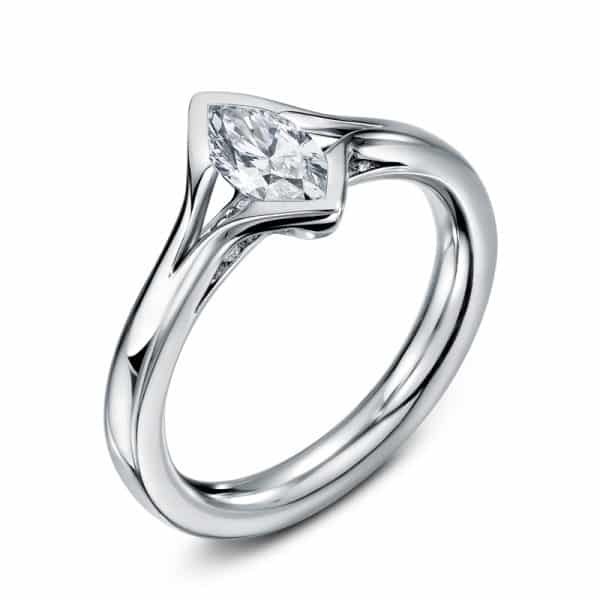 The Reveal Marquis engagement ring is also available to buy with a matching wedding band.